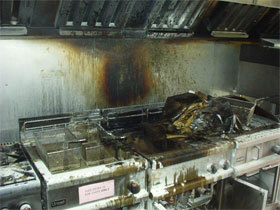 The commonest cause of fire in restaurants of all types and sizes is cooking. Of all of the cooking appliances the deep fat fryer is the biggest reason fires occur, be it a pub restaurant, hotel restaurant, take away or sit down one. A deep fat fryer on fire will quickly grow and involve the whole kitchen and possibly the whole building surprisingly quickly. The usual extraction flues can assist this spread! 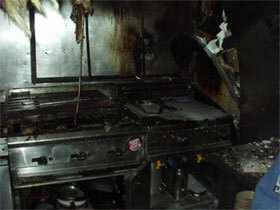 Do your staff know how to deal with a kitchen fire? 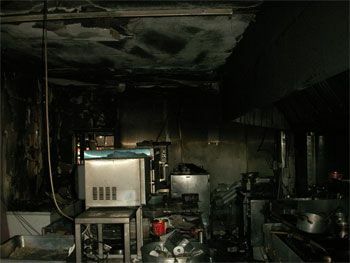 Is your risk assessment thorough enough to enable you to take all necessary precautions when it comes to fire safety at your restaurant - whatever its size? We'll work with you to cost effectively manage all your fire safety requirements! This fire nearly cost the business the whole building. The fire injured a worker who didnt know what to do when confronted by the fire and had started to burn inside the extractor flue, threatening the rest of the building. 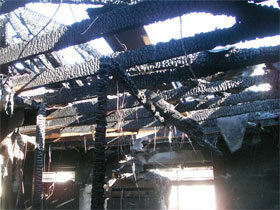 The fire damged the kitchen which had to be closed for two months for renovations and repairs. Although the insurance paid out, they didn't cover loss of earnings. The business was very lucky the fire service turned up so quickly! This fire started in the deep fat fryer and did go through the extractor flue, into and through the roof and started to attack the flats above. Luckily the fire alarm system in the flats worked and the occupants were woken and made an escape. The fire started some time after the kitchen had closed for the night! This fire went unchecked due to an inadequate fire alarm system, destroyed the take away restaurant below, where it started then burnt up into the flats above and burnt through the roof. The row of other shops and flats that the takeaway was part of were also badly damaged by heat and smoke. It was chance that the occupants of the flat were out when the fire started!